Bring a bit of New England to your table with these tasty stuffed clams! Serves 4-6 People! Scrub the clams under cold running water. Shuck the clams and transfer the clam meat to a cutting board. Scrub the shells and set aside. 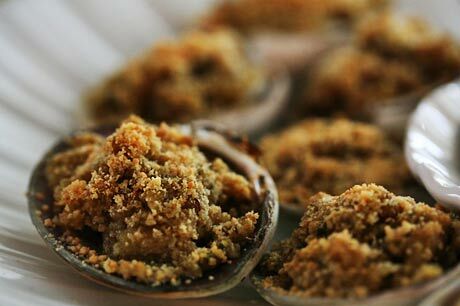 Chop the clams and mix with the bread crumbs, cheese, salt, garlic and butter. Spoon mixture into clam shells, overfilling them a bit. Arrange filled shells on baking sheet and transfer to oven where you’ll bake for 15 minutes or so.